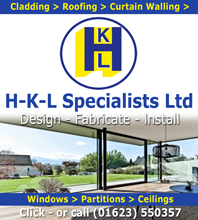 HKL Specialists Ltd - Design, Fabrication and installation of Aluminium Windows, Sliding doors, Partitions, Ceilings, Cladding, Roofing and Curtain Walling for Domestic and Commercial properties and proud sponsors of the Chesterfield Post Staveley MWFC news section. Staveley deserved a point from this hard fought game against local rivals Worksop Town but were the architects of their own downfall as the home side scored twice after Staveley conceded possession cheaply. Manager James Colliver (left) made two changes from the side that won at Maltby on Saturday with Austin McIntosh and Ellis Wall replacing Matt Hassett and Ryan Watters. A crowd of 505 ensured there was a good atmosphere with 30 or so supporters from Staveley. Worksop started the game better and showed the ability to move the ball forward quickly and basically play at a high tempo. Staveley found themselves on the back foot initially and had trouble keeping their shape which allowed Worksop to get forward down the flanks, particularly on the left hand side where full back Conor Smyth often found himself in plenty of space. Worksop forward Andre Johnson has already grabbed 11 league goals this season and he demonstrated why during the first half with quick movement and the ability to find space in the penalty box. He almost opened the scoring after six minutes when he beat the offside trap and found himself one on one with Steve Hernandez. However Staveley's keeper came off his line smartly and got down quickly to block the striker's run. The rebound fell kindly to Johnson but he saw his shot headed off the line by Brad Jones. Worksop opened the scoring on 25 minutes after Jack Watts lost possession in midfield. The ball was moved forward quickly to Mitch Husbands who scored with a low shot from the edge of the box that gave Steve Hernandez no chance. Staveley then equalised with a spectacular goal after 41 minutes through Ryan Damms. The Staveley forward picked up a header from Sam Finlaw and, spotting keeper Ben Gathercole off his line, found the net with an accurate lob from 40 yards (maybe more!). Staveley had the better of the remaining minutes of the first half and forced three quick successive corners. The third was cleared as far as Nathan Forbes but his curling shot was straight into the arms of Ben Gathercole. The second half was fairly evenly balanced with both sides creating chances. Staveley grew stronger as the half went on with Staveley's Man of the Match Pat Lindley (left), winning plenty of midfield possession and the introduction of Joe Flint for Nathan Forbes gave them added power up front. Ironically Forbes had a goal ruled out due to a questionable offside decision just before being substituted. It started to look as though both sides would take a point from the game but Staveley then pushed the self-destruct button with only seven minutes left! Jack Watts tried to play himself out of a tight spot but with several Worksop players around him, he lost possession. The ball was then crossed to the far post where Worksop's Chris Whincop beat Steve Hernandez with a powerful header. The goalkeeper was clearly furious with the players in front of him, especially as he had made a number of saves to keep his side in the game. Staveley remain in seventh place in the league after this result. 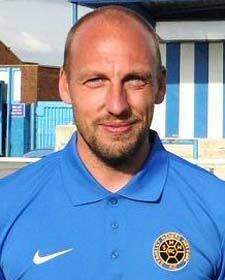 Staveley's next game is at home against leaders Tadcaster Albion on Saturday 4th October (3pm). They then have four consecutive away matches, starting with a Sheffield & Hallamshire Senior Cup tie against Rossington Main on Tuesday 7th October. Home fixtures in bold. All fixtures are subject to change. Staveley's 'Young Guns' scored two late goals to overcome 10-man Garforth and record their sixth consecutive league win despite missing a first half penalty. Staveley MWFC's Chairman and owner, Terry Damms, states the club are forming a new committee to help with expansion plans they have for the Toostation Premier Divison side. Staveley produced arguably their best - and worst performance of the season on a glorious early Spring Saturday afternoon, at home game against Thackley. Staveley MWFC's only game of the Christmas period took place at Inkersall Road yesterday against near neighbours Worksop Parramore. 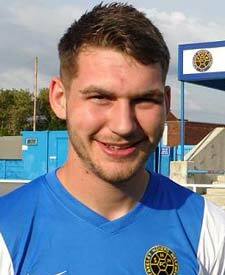 Staveley MWFC were unable to extend their unbeaten run to eight games with a poor performance that saw them deservedly beaten by Garforth Town. Staveley showed great resilience and tenacity to progress to the last 64 of the FA Vase, with a hard fought win against tough opposition. On Wednesday Howard Webb refereed the friendly between Staveley MWFC and Chesterfield and spoke with the Chesterfield Post. More..
Staveley MWFC faced a few questions about their character after the weekend's disappointments when Glasshoughton Welfare came to Inkersall Road. More..